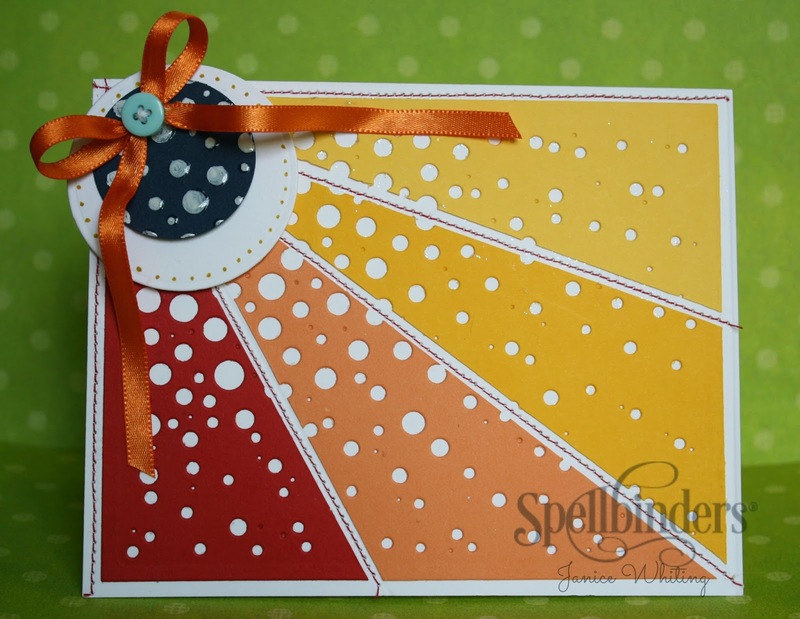 Welcome to day 4 of the Spellbinders Summer Sneak Peek and Giveaway! The dies that have been shown over these past four days are slated for release at the upcoming Craft and Hobby Association Paper Arts show in Atlanta, Georgia. I am excited to get to introduce a fun, new Spellbinders die template named Cascade Dots S4-456. Spellbinders is giving away this new die template set , as well as the new die template sets used on previous sneak peek blogs this week and a fabulous grand prize! Be sure to look at the end of the post for more details and instructions on how to enter the giveaway. 1. Create a card base of 6" x 4 3/4". 2. Cut/emboss one Cascade Dots to use as a template, then, using a craft knife, cut your desired size "rays". 3. Cut/emboss four Cascade Dots in your desired color, then using the template earlier created, cut your rays using a craft knife. 4.Adhere your pieces onto your card base, creating "rays." 5. Using red thread, sew lines down between each ray created. 6.Cut/emboss Standard Circles Small die #4 (with 1 being the smallest from the center) in white, using a yellow pen, draw a ring of dots following the embossed edge. 7.Trace then cut out the inside of Standard Circles Small die #3 in navy blue, use Cascade Dots as a stencil and stencil the dots using a white gel pen. 8. Adhere the Standard Small Circles die cuts to card. 9. Adhere bow and button to finish. how to enter the Spellbinders Sneak Peek Giveaway! This link will work for 48 hours, and will then be disabled. Questions? Direct questions here: ContestQuestions@Spellbinders.us, but be aware that entries are not accepted at the questions email address. Thank you for visiting, and best of luck in the contest! This one is another fun die. Love the bright and cheery look. Love your card Janice - the ombre effect, the stitching and the circular die cuts make a fantastic card. Fun card!!!! Love how you added the die cuts!! Love the idea behind this fun die and the fun look on the card. Such a fun card here too, and sooo beautiful too. Great card Janice ! I never would have thought of using that die like that ,love it ! That is a fabulous project, Janice! WOW!!! Can't wait to be able to buy this die. so many great things to do with it. Love what you made. LOVE this dotty die!! Your card is amazing. The card is so bright and FUN! I love the new die. LOVE your card, the rays are FABULOUS, the colors are too!!! I love how you broke up the die panel into "sunrays!" Very clever use of another great die! What a great use of this die - such great colors too! This die has soooo much potential. Thanks for sharing. LOVE your card!!! I can think of a million and one ways I would use this die!!! So cool! TFS! Very cool way to use this die - love the card! great tutorial, the stitching adds the perfect touch to this card!!! How clever using the new Cascade Dots die. Won't this be a fun way to create projects this fall! This is absolutely a must have die. Your card is fun and cheery. Thanks for sharing. WOW Janice I LOVE what you created with the die - so very inspiring! Love your card! This die is going to be fun to work with. Your card is spectacular, it really caught my eye. Love, love love all the circles in this die. The card you made is superb. Thanks for the inspiration. What a delightful and fun card using those dies. I love the bright colors too. That is a wonderful cheery card. I can see lots of possibilities for that die. I love to make stencils and that one really appeals to that art form. Thanks for sharing your card. Love the bright colors and cheery feeling associated with your card. Great use of the die too. Love the creative use you chose with another great new die and the bright & cheery card! Thank You for sharing it with us! Adorable card! And a great way to use up some of my never ending scraps. Thanks for the inspiration! What a fun card. Another great die for masculine cards. Thanks for sharing. Colorful card. Love the new die, and how you used it. Good job. Great card! And very neat die too! Love your card design, I have never tried anything like that, thanks for showing us what you did. :) Thanks for sharing. Super cool card, and a great way to use that die! Love your colors, too. Tfs! This is just amazing! I definitely NEED this die. very creative, great for summer! Love this card and the unique die. So cute and fun. Great work! Oh, be still my poor wallet---Yet ANOTHER must have die for me! Love what you have created here, just a pleasure to the eyes!!! Love the great way you used this die. Thanks for the inspiration. Love the colours you've chosen for this card, bright and cheery, thanks for sharing your ideas. What fun! Love how you showcased this die! What a fun die and your card is so fun. Love it. Oh my gosh, this is so cute! You could make several cards at once by mixing up your colors. What a very versatile Die! There's so many ideas are popping into my head. TFS! I would definitely love to be the recipient of your card as I am sue anyone would. Very uplifting, bright and fun!! Thanks so much for sharing.